Setting up your first betta fish tank can be somewhat intimidating, but it shouldn’t be scary! In fact, it is good if you do feel a little worried, it proves you care and want to learn. This post will cover important steps you should take in order to create the perfect setting for a betta fish tank, it will state the importance of water cycling and give you tips for taking care of your new fish. We recommend 5 gallon (20 – 25 litre tank) or more, this will ensure you have the healthiest and happiest betta fish – which is what having a pet is all about. Another tip is that is is also good to have an aquarium that is longer than high. This isn’t too important but if we were to think of the betta fish’s natural environment – shallow streams – you will see that water depth isn’t too important but longer horizontally swim areas would be of benefit. 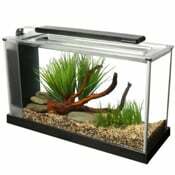 Some recommended tanks include, Fluval Spec V Aquarium Kit and biOrb FLOW . Position the tank where there is no direct sunlight, but still remains open and visible. Bettas like attention and don’t like dark corners of the room. Do I need a filter for my betta fish? A filter is a must to help keep the water cleaner for longer. However betta fish do not like strong flowing water / currents. So what is recommended is a gentle aquarium filter, or one that has an adjustable flow. The filter will keep the water clean and healthy for the fish. The filter should have a manual that shows you how to set it up. After adding it to the aquarium make sure that it works and hopefully it won’t be creating too strong of a current. If you think the filter is too strong and your filter isn’t adjustable you could create a baffle from an inexpensive tank divider or make sure there are a few plants in the way to break the current. Betta fish are from tropical waters. The water temperature they like is around 77 – 80 degree Fahrenheit. This means that in most countries, yes you should have a heater on your tank. It is important to keep temperatures at a constant. Fluctuations can be dangerous to your fish’s health. This is the job of the aquarium heater, it includes a thermostat ensuring a constant correct temperature even if the temperature in your house goes up and down. We have reviewed some ideal aquarium heaters and produced a guide here. Next add some substrate or gravel to the bottom of the tank. Beginner betta fish tip: When using large gravel uneaten pieces of betta fish food fall and place themselves down the gaps of the pieces of gravel. This is hard to clean and leads to dirty water. Smaller finer gravel will help combat this. If you want to use live plants you may have to look into the substrate so that the plants can grow and flourish. Before adding any live plants it is advisable to half fill your tank with water as it helps you to place the plants. Live plants are recommended. Check out our guide for more detailed information on how to add live plants to your aquarium – this offers step by step instructions. This is a great step! 🙂 Now it is time to make the betta fish aquarium that you have set up look great and be a fun home for your fish buddy. Add some fun aquarium decorations or maybe create a themed tank with the use of some ornaments – there are unlimited possibilities. It is always good to think of whose home it is and cater for their needs though. Betta fish love little hidey holes, nooks and crannys to swim to and from. The traditional and iconic aquarium castle actually makes a great feature to the betta fish tank – and they love hiding in them. Or how about a SpongeBob themed Aquarium ? Plant pots – there has been a small craze of putting terracotta plant pots in fish tanks. This has led to many fish injuries! The drainage hole of a terracotta plant pot has very sharp edges, and fish (especially betta fish) swim quickly through this hole which can lead to huge and deep grazes. Sharp fake plants – quite often fake aquarium plants are made of plastic. If you buy plastic plants make sure that the leaves do not have sharp edges. Betta fish fins are very delicate; any sharp edges can easily tear a betta fish fin. (Keep this in mind for all your decorations). So your tank set up is ready and the decorations look great but the water conditions aren’t quite there yet. A fishless cycle is what is required next. Without a fishless cycle your betta could experience ‘new tank syndrome’ – it can kill fish. Basically what this cycle does is build up beneficial bacteria in the tank / filter. These beneficial bacteria are used in the tank to break down harmful fish waste (ammonia) into a less toxic form, first to nitrite and then down to nitrate. Once this cycle is established your tank should stay at a steady Ammonia reading of 0 and Nitrite reading of 0. A lot can be written on this subject and it’s a whole other blog post but it is important to know! That’s why I have to point you towards another page on the web that says it all. (Yes, I’m pointing you away from my site. Not many other bloggers would do that, but this is a great page that includes a calculator). And now you have set up a betta fish tank! It’s time to choose your new betta fish from the local pet store and add it to the newly setup aquarium. Firstly, add fish slowly to the newly set up aquarium (not numerous fish in one day), this links back to the nitrogen cycle. Secondly, betta fish have another name that you may be aware of, Siamese fighting fish, they get this name for their aggressive and territorial nature. It is important to know what fish can live with bettas, this blog post will go through the details, but in summary no two betta fish should live together, you should avoid colorful fish with flowing fins and your tank needs 5 gallons of personal space for your betta fish. And remember, please don’t use tiny tanks or vases – the water gets dirty / poisonous fast and limiting the movement of the fish is unhealthy and just plain cruel. Yes, betta fish have evolved to survive in small areas of water for periods of time before finding their way back to a stream but the keyword there is survive – they are not happy or healthy, that isn’t a life! Hope you now have your betta tank set up perfectly with many happy years of friendship ahead of you :). Leave a comment describing your betta fish tank or even better a picture or video and let me know what you thought of the article – or if you would like to add to it. Kudos on writing a guide with proper care information. Far too many people think that because Bettas can survive in a tiny unfiltered bowl that that’s a good home for them. I just purchased a 2.5ltr mini fish bowl along with a beautiful red betta. I’m sorry I did now- I feel he is not too happy, I didn’t get a heater for him initially the aquarium said there is none for such a small tank. Wondering if I should put him in with my Platys and guppy?? What is your opinion on betta fish hating “current” at the water surface from a filter? I have read that they breath from the surface and some believe that these fish actually hate it when there is current that gets in their way when trying to breath.. I would love to know your opinion on this..
Betta fish have delicate flowing fins which makes it tricky for them to fight a current when they swim. I don’t think it is too much of a problem but it is better if you only have a gentle current flowing from the filter. Currents can also effect their bubble nest building. I am considering getting a betta, and not having kept fish before I have been doing a lot of research. I think this is the most informative and clearly organized site I have seen. Thank you for your work in maintaining this site. Hello I want to buy a Betta fish and I have my old 5gallon tank that I would like to use but the whole back side is a mirror. Is that ok or is there any way I can make it ok for my futur fish. No I would not recommend a full back mirror for a betta fish. He will get too stressed thinking there is another male with him. I have a 20 gallon tank, I have nothin’ in it cuz meh goldfishes died ;(. ANYWAYS What should I put in it? a girl betta community or a male betta with other fishes? Tell meh pplz, if I do make a male betta with other fishes, what kind? I like the neon tetras, they look cool with the betta too! And they can be tank mates! 🙂 Tell meh guys! 😀 my youtube is yinwolf Aj! Check it out! I make animal jam videos! I only have a 2 gallon bowl, and no filter. Is it really nessesary to have a filter? Right On! Very well written article about how to get your betta tank set up. Of course the one of the most important things is to ensure you have the perfect tank for your betta to live in. A betta should have plenty of room and be treated well at all times! Do the pantyhose test on the plant edges. If you run the fabric along the edge of a leaf and it snags, it is too sharp. If so, don’t worry. Simply file it down a little with a nail filer or some small grain sandpaper until no longer sharp. I recently just got a 5 gallon tank for my future betta. I’m just wondering roughly how long it takes to fishless cycle a 5 gallon? Any tips on speeding it up? I have the heater and filter and plan to start cycling tomorrow. hiya i have recently bought a male betta fish, he was lively for the first month however now he seems to be resting and swimming at the bottom of the tank. the tank is cleaned regularly and water is fine, his fins are also a little tattered but they have been like that since i have bought him, any advice? hope general finn will love his finding dory and spongebob home, soon will have general finn and after awhile i will get general bubbles and split them up one will get spongebob and the other finding dory will have 10 gallon tank so each gets 5 gallons!